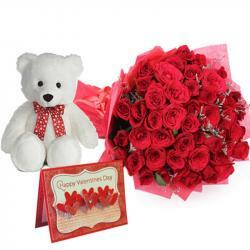 Product Consists : Bunch of 12 Red Roses along with 12 Inch Teddy bear. 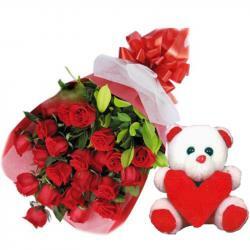 A special gift for your friend to say thanks you, will not be better than a teddy bear with dozen red roses. The teddy bear is made from very soft material which is very fluffy and cute. It will be adored by her for lifetime. 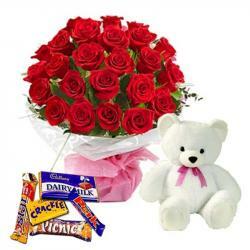 The combo also has a rose bud which is dark red in color which is fresh and handpicked especially for you. It is decorated with ribbon bow which looks amaze. 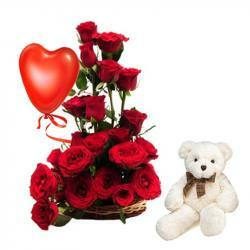 Product Includes: Bunch of 12 Red Roses along with 12 Inch Teddy bear.